There are various reasons why soil may be affected by contaminants such as chemicals and heavy metals. This is often the case in mining, where various processing chemicals and heavy metals may leak into the ground, contaminating the soil. 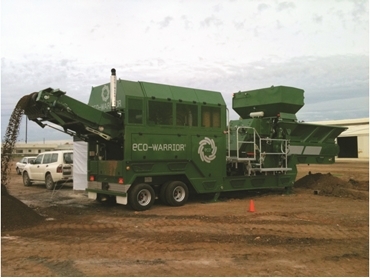 ECO-WARRIOR is a soil remediation machine built by Adelaide company Broons Engineering for UK company SoilXchange that is designed to solve these contamination issues. The machine accepts waste soil and mixes it with a range of additives such as lime, cement, water or biological reactants to produce a product at the other end which has certain geotechnical or other improved properties. Designed to be mobile, the machine is fitted entirely on a custom built semi-trailer platform, allowing it operate on site or in a depot with soil brought to it for processing. The machine consists of an infeed conveyor, inline belt weigher, additive hopper on load cells with rotary vane feeder, water sprays, mixing chamber and discharge conveyor. Power is provided by a 300hp turbo charged diesel engine which drives a hydraulic system as well as providing electrical power. Electrical systems were designed and built by Ade­laide company APC Integration (APCI), and hydraulics were designed and built by Adelaide company Staker Hydraulic Specialists. APCI managing director, Anthony Dally, said the main challenge was the selection and design of a control platform that met all of the customer's requirements. "To meet these requirements, only a Beckhoff PLC platform satisfied the versatility, performance and price criteria," he said. "The control system is based upon a main Beckhoff CX9000 series PLC which also serves as the HMI platform, EtherCat remote I/O controller, CANBUS master and Ethernet IP camera interface. The PLC performs all sequencing on the machine to start, stop and pause operations, as well as monitor the machines health and control the addition of water and additives to the required ratios. "Setpoints to operate the machine are entered via the HMI interface. As soil is loaded onto the infeed conveyor the infeed conveyor moves the soil forward over an inline weigh cell which measures the tonnes/hour and volume/hour of material entering the machine. "Water dosing is PID controlled with a modulating valve and fixed speed pumps fed from a tank to achieve the correct flow rates. Additive dosing is done by the hopper which is fitted with a speed controlled hydraulically powered rotary vane feeder, load cells to measure the weight of material in the hopper, air fluidisers to keep the material flowing and air hammers to break additive bridges. "The control system operates this process with feed-forward control, continuously trimmed by a PID loop working on loss of weight in the additive hopper. The system automatically recog­nises when the hopper is being refilled and pauses the PID component during this process. Control algorithms on the machine can work on a weight or volume basis so that the machine can continue to operate with the loss of any of the load cell systems. "A significant challenge encountered during the project was filtering the load cell signals distorted by operating induced vibrations. The infeed conveyors inline belt weigher was successfully processed by the Beckhoff PLC using digital filtering techniques. However, the complexity of the filtering on the additive hopper required a dedicated load cell conditioner from Metler Toledo which communicated the filtered hopper weight signal via an Ethernet connection using Modbus TCP," said Dally. He says the operator interacts with the machine through the use of the control panel buttons and the HMI software which was custom written by APCI. "The HMI is used to communicate with the Beckhoff controller to collect information, accept touch screen inputs from the operator, enter operating setpoints, and select operation by volume or mass for some of the control loops," he explained. "It also provides the operator with feedback while they use the control panel buttons to increase or decrease setpoints or adjust the speed of various machine components in manual or automatic modes. "In addition, the HMI is used to view the images from the two Ethernet IP cameras attached to the system, record production information, view machine alarms and status information, and connect to the 3G router for remote access. No off-the-shelf package could easily integrate all these features seamlessly enough, so we used our years of custom software development experience to write a custom HMI application for the machine." Staker Hydraulic Specialists (SHS) was responsible for the design, installation and commissioning of the hydraulic system that powers all primary rotary drives and linear actuators on the ECO-WARRIOR. According to SHS director, David Rogers, one of the main design directives was to deliver power for the primary drives with the highest possible efficiency in order to keep fuel consumption to a minimum. "The upper and lower mixing chamber drives, which are the main power consumers, are powered by hydraulic closed loop transmission systems, and the speed of these drives is ­controlled by 4 to 20 mA analogue signals from the machine's primary PLC to the pumps servo control valve," he said. Feedback of current rotor speed and drive load is displayed on the operator's console. These speed and load feedback signals are delivered by high frequency proximity switches in the motors and pressure transducers at the pumps. The machine's primary PLC sends required speed drive commands via the CAN to a Sauer Danfoss Plus1 programmable controller that then sends analogue command signals to the proportional valves. "The infeed conveyor and product delivery drives utilise electronic closed loop speed control, which is a feature provided by the Plus1 controller. "These two drive motors include high frequency proximity switches that deliver drive speed feedback to the Plus1 controller which constantly updates the command signal to the proportional valves. This ensures that these drives operate at consistent speed irrespective of oil viscosity and load variations." Rogers points out that one of the hydraulic design requirements was to build a system capable of operating within a wide range of ambient temperatures (-10 degrees to +35 degrees C). "The ECO-WARRIOR hydraulic system is equipped with additional valves and thermostatic controls which deliver an oil heating process while the engine is running at low speed. Once the oil heating process has been completed the machine can be put into full operation irrespective of the current ­ambient temperature."